Besides Feed - What Else Does a Chicken Need? 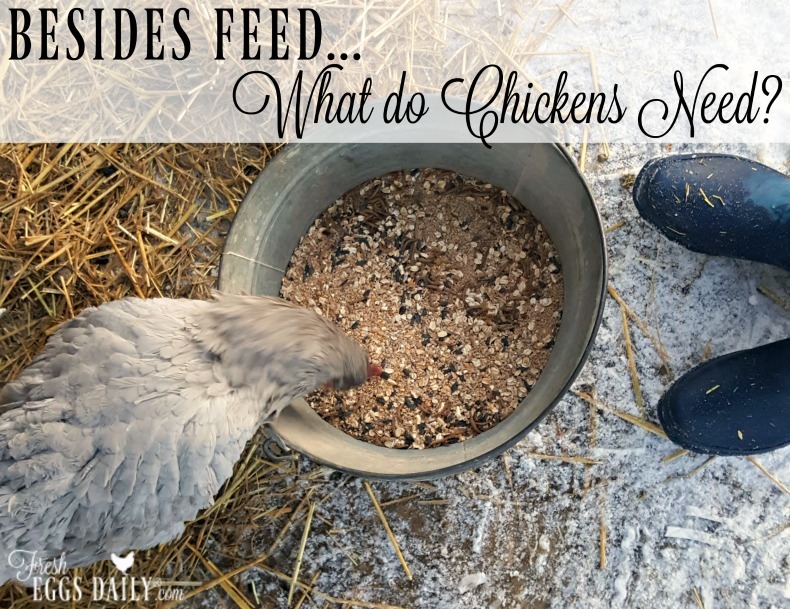 A good-quality layer feed is the cornerstone to optimal flock health, but in addition to a well-balanced feed (maybe with a few natural supplements thrown in to boost immune systems and overall health), chickens also need two important things added to their diet. Namely, insoluble grit and a calcium supplement. 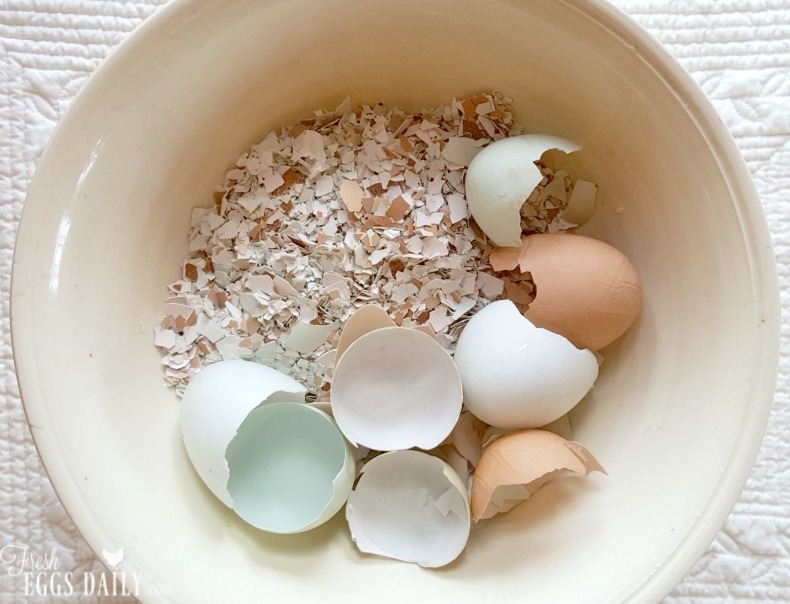 Although chicken layer feed has calcium in it, providing a calcium supplement for your laying hens is also a good idea since eggshells are more than 95% calcium. If a laying hen doesn't get enough calcium in her diet, she will start to leach the calcium from her bones to make the shells on her eggs - and that can lead to poor health or broken bones. The calcium supplement should always be fed free-choice, meaning not mixed into the feed but instead offered in a separate container so each hen can eat as much or as little as she needs (and young non-laying hens and roosters won't eat any). #freshtip Save and dry your chickens' eggshells then crush them and put out a small dispenser in your coop. Since chickens don't have teeth, they need a way to grind up and digest the food they eat. 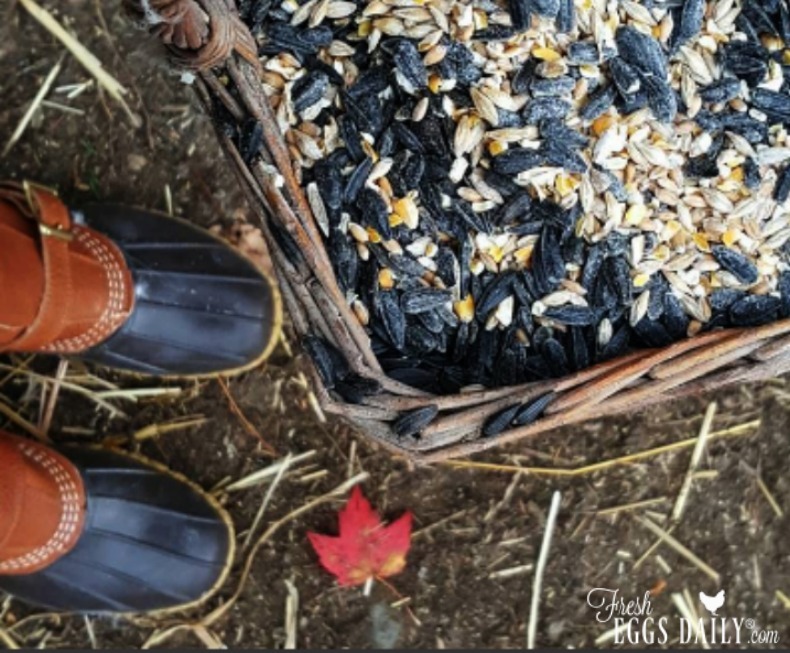 When they are free ranging, they do this by picking up and swallowing small stones, coarse dirt, and pieces of gravel and rock, but if your chickens are confined to a run or pen, you will need to provide them commercial poultry grit. Again, it should always be provided free-choice in a separate container from their feed so each can eat as little or as much as he or she needs. 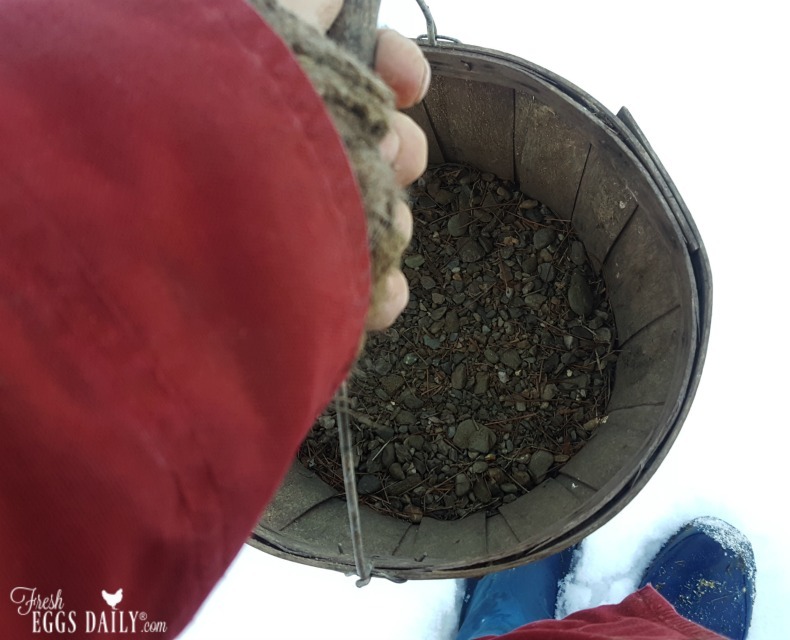 The gravel is stored in the gizzard and overnight is used to grind up what your chickens eat. Eventually the pieces get so small that they are passed through the digestive system. #freshtip Since our chickens get out to free range for a bit nearly every day, I don't worry much about providing them grit during the warm months, but since the ground is frozen and covered with snow for so much of the year, in the fall I fill a few pails with some coarse dirt and gravel and keep a dispenser full in the coop. The chickens go through it and pick out the size stones they want and I periodically dump out the rest and refill the dispenser. Scratch grains are a treat. They are a huge hit with my girls, but I limit them to 10% of their total diet. #freshtip Or you can buy assorted grains and seeds in bulk and mix up your own custom scratch mix. Herbs and weeds are incredibly nutritious for chickens. A commercial blend of dried crushed herbs added to your chickens daily feed can help boost their immune system, control manure odor and produce vibrant orange egg yolks. 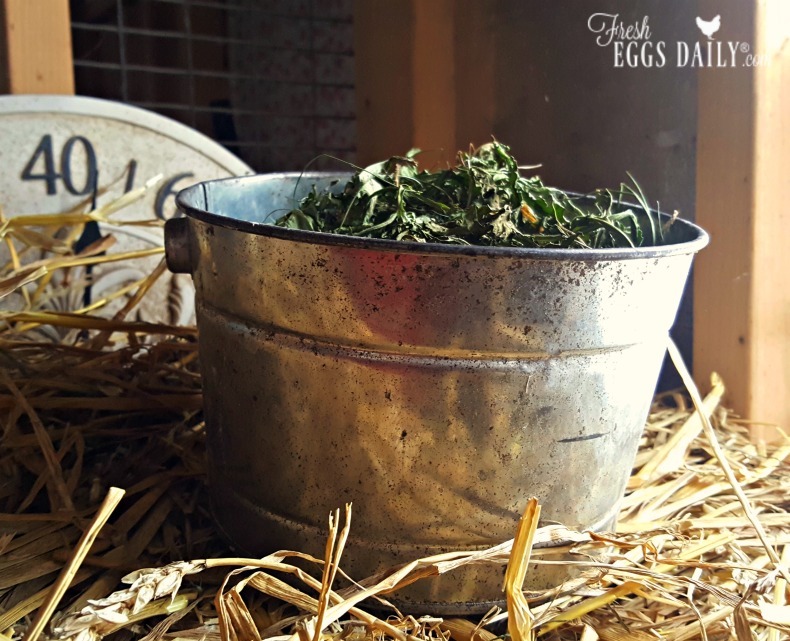 #freshtip In the fall, I pick a few bucketfuls of dandelion greens and air dry them, then crush and add them to our chickens' feed through the winter when they can't be out foraging for fresh grasses and weeds. I do the same with a variety of herbs that I grow including oregano, basil, parsley and sage. Join me here Facebook | Twitter | Instagram | YouTube| Bloglovin' |Google+ ©2016 by Fresh Eggs Daily, Inc. All rights reserved.